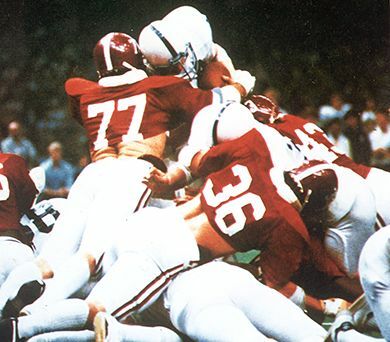 Late in the 1979 Sugar Bowl, trailing 14-7, Penn State had second-and-goal inside the Alabama 1. After the third-down thrust came up 6 inches short, Tide defensive lineman Marty Lyons said to Nittany Lions quarterback Chuck Fusina, "You better pass." On fourth down, the mid-air collision between back Mike Guman and linebacker Barry Krauss knocked the rivets on Krauss' helmet loose. Fusina really should have passed. Alabama 14, Penn State 7.